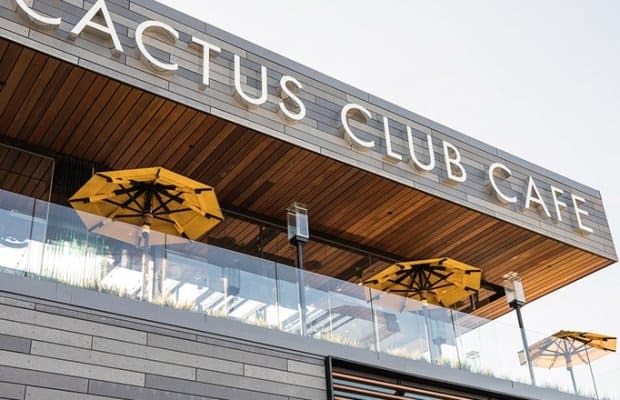 TORONTO, ON – October 19, 2018 – Torontonians can prepare to enjoy approachable and undeniably delicious, modern Canadian cuisine as Cactus Club Cafe announces today the opening of their second Ontario location at Sherway Gardens. It is an integral part of the shopping centre’s major $550-million redevelopment that has brought several new high-end retail and dining options to Sherway. Doors officially open at the new location on Wednesday, October 24 at 5:00pm. Cactus Club Cafe’s culinary vision will be served to Sherway diners from a menu developed by their Test Kitchen, which is led by a team of world-class chefs including Iron Chef America champion Chef Rob Feenie, who will be commanding his title on this season’s Iron Chef Canada where his first battle commences Wednesday October 24th at 10 p.m. ET/PT on Food Network Canada, and Head of Culinary Development, Toronto, Chef Cory Vitiello. The menu will feature a mix of signature dishes, such as Chef Feenie’s Butternut Squash Ravioli with Prawns and Double-Braised Short Rib, as well as new highlights including Chef Vitiello’s Lobster and Prawn Tagliatelle Nero with pistachio green chili pesto and Mediterranean-inspired Salmon Fresca with fresh herbs, baby gem tomatoes, shaved fennel and hummus. New vegetarian and vegan menu items will also be featured on the menu, such as the Tofu Lettuce Wraps and Grilled Tofu Modern Bowl. To satisfy those with a sweet tooth, guests can enjoy Chef Feenie’s warm Apple Galette served with Tahitian vanilla ice cream. In addition to the menu of globally inspired foods, sommelier and service director Sebastien Le Goff has developed an extensive wine list that includes bold, esoteric, and intricate offerings to highlight Canada’s growing wine industry, old world gems, and new world discoveries. The two-level, 450-seat restaurant features sleek and modern décor. The restaurant’s noteworthy art collection includes pieces from internationally recognized artist Andy Warhol, the influential Jean-Michel Basquiat, Japanese contemporary artist Takashi Murakami and well-known LA street artist Mr. Brainwash. Most exciting of all, joining the ranks of these international artists and described by The Toronto Star as “the next Andy Warhol,” Daniel Mazzone has created a show stopping custom piece that adorns the wall of the two-story entranceway. Beyond the art, the retractable roof is also a standout element, with the second-floor all-season dining room and lounge featuring one of the largest retractable roofs found at any restaurant in North America. Recognized nationally as one of Canada’s 50 Best Managed Companies, Best Workplaces in Canada, Large & Multinational and Canada’s Top Employers of Young People, Cactus Club Cafe is proud to be creating jobs in Canada, including hundreds of local Torontonians for this new location. Cactus Club Cafe Sherway Gardens will offer daily afternoon and late night specials, as well as half-priced bottles of wine on Tuesdays and Wednesdays. Doors open to the public at 5pm on Wednesday October 24, and then are open daily 11:30am to 1am.